Customized fertilization and pest and weed control programs combined with mowing services keep your lawn healthy. Additional services such as aerations, liming, and total lawn renovations will provide you with a lush, green lawn. Why do I have weeds when you have already treated? Weeds that were present at your residence on the day of the application were sprayed, however turfgrass weeds can grow more rapidly than your grass. New turfgrass weeds grow every week if the culture is favorable for them. Why didn't all my weeds die with the first chemical treatment? Some of the common turfgrass weeds are difficult to kill, especially with just one chemical treatment. Weeds such as ground ivy and wild violet are often considered difficult-to-control due to aggressive growth, waxy leaves, and variable resistance to most common herbicides. Why do I have crabgrass? We apply pre-emergent fertilizer that prevents new crabgrass plants from growing in the spring. If the lawn is not maintained properly, low height of cut or insufficient water supply, than crabgrass has favorable conditions to grow. How much watering is necessary for the lawn? In general, quality turfgrass needs 3/4" to 1.25" per week. This is dependent on soil type, temperature, and humidity. Be sure to water deeply and not short frequent watering, which will encourage weed germination and shallow root growth. How Often Do I need to cut the grass and at what height? Generally, once a week cutting is appropriate for most seasons of the year. 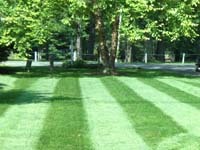 In some instances, during rapid growing seasons, it may be necessary to cut the lawn two times in the span of 7-10 days. Keep in mind, never to cut more than 30% of the turfgrass blades, and the cutting height should never go below 2.5 inches and should be maintained at 3 inches in the hot and dry months. Why do I have moles if you have treated for grubs? A moles primary food source is regular earthworms. Moles will eat grubs, if they come across them, but grubs are not what they are solely looking for. Moles are in your lawn because they were chased out of your neighbor's lawn and found yours. How often should I aerify and overseed? Biafore Landscape Development recommends aerification at least once a year. Aeration helps control thatch, improves the soil structure, helps create growth pockets for new roots, and opens the way for water, air and fertilizer to reach the root zone of your lawn.